Panchakarma is a traditional Ayurvedic cleansing and rejuvenation program for the body, mind and spirit. 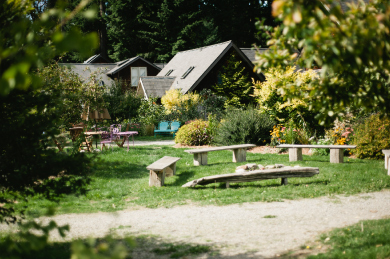 The Panchakarma program includes pre-purification methods to nourish and prepare the body to let go of accumulated toxins, followed by the purification methods themselves. Panchakarma uses full-body massage with warm, herbalized infused oils, herbal steam baths, salt scrubs, and a number of other ancient healing therapies which, when taken in a specific sequence, gently and effectively purify the body. 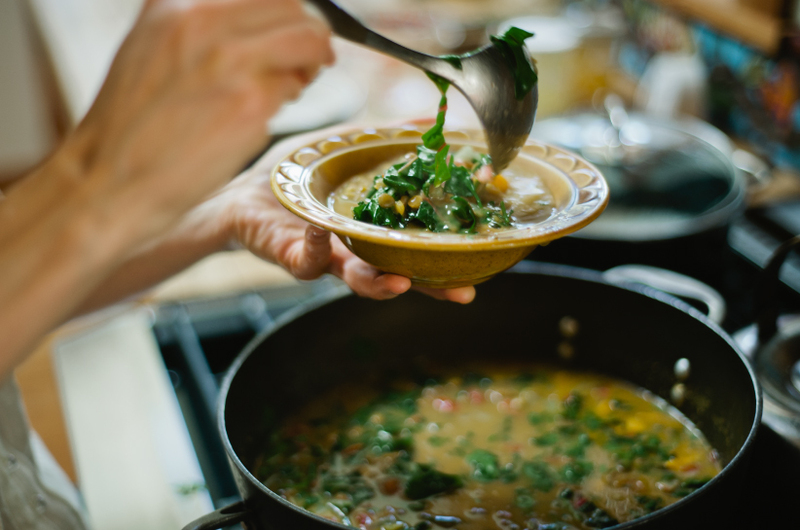 According to Ayurveda, health is a perfect state of balance among the body’s three fundamental energies, or doshas (Vata, Pitta, and Kapha), and an equally vital balance among the body, mind and soul. Changes in age, seasonal changes, wrong diet, habits, lifestyle, repressed emotions and stress factors can all act to upset our natural balance, weakening our agni (gastric fire) and leading to accumulation of toxins. These toxins and deep-seated emotions build up in the tissues of the body and can lead to dis-ease if not eliminated. Panchakarma is a completely natural form of healing, in which the body is encouraged to simultaneously let go of its excesses and retrieve its essences. Through purification of the subtle channels in the body, the beautiful wisdom and innate intelligence, which is inherent in every cell of our being is allowed to function. By removing blocks to this biological intelligence, the entire physiology is integrated, immunity is strengthened, and the damaging effects of aging are reversed. The aims and objectives of this science are to maintain the health of a healthy person and to heal the dis-ease of an unhealthy person. This is obtained by restoring the balance of the natural processes in the body. The ancient texts praise Panchakarma as a seasonal rejuvenation treatment for ensuring balance year in and year out. Increases energy, vitality and mental clarity. Improvement in appetite and digestive patterns. Reverses the negative effects of stress on the tissues and cells of the body. Restores the individual’s basic constitutional balance. Rejuvenation of body, mind and spirit. 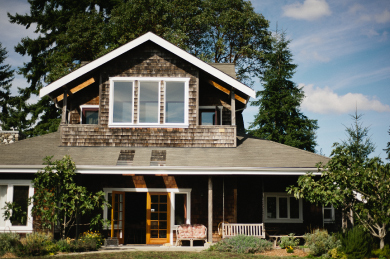 A supporting and caring environment that provides space for true contemplation and self-exploration. Each day of panchakarma will be facilitated by an Ayurvedic Practitioner and 1 or 2 Ayurvedic Therapeutic Specialists who will be giving you Ayurvedic treatments based on your constitution and daily process. 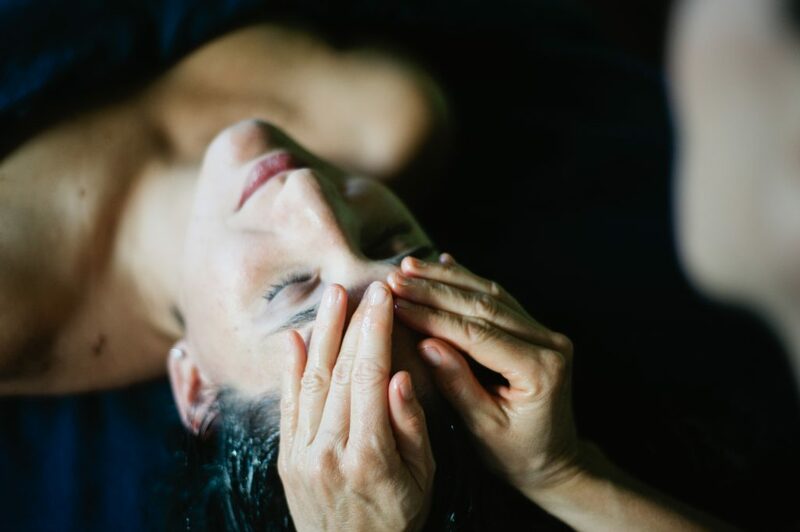 The purpose of these treatments is to profoundly relax the body and mind, improve the flow of energy by opening the channels of circulation, and to prepare the body to eliminate excess toxins (ama) on the physical, emotional, and spiritual levels. A typical Panchakarma session begins with an abhyanga, which is an Ayurvedic warm oil massage with 2 therapists working simultaneously. Marma Chikitsa is incorporated into your daily abhyanga. Pressure is applied to the vital healing points affecting the organs and subtle channels of the body. The client will receive “swedan” a therapeutic sweat, which is done in a steam box with essential oils. This dilates the channels of circulation, further loosening and removing impurities through the skin and gastrointestinal tract. An herbal or sea salt scrub is worked into the entire body to promote circulation, stimulate the lymphatic system and improve immunity. Another traditional treatment is Netra Basti. A dough ring is applied around the client’s eyes, in which warm ghee is poured to fully saturate the eye, which nourishes and relaxes the optic nerves. This treatment relaxes and soothes the entire nervous system and brings clarity of mind. 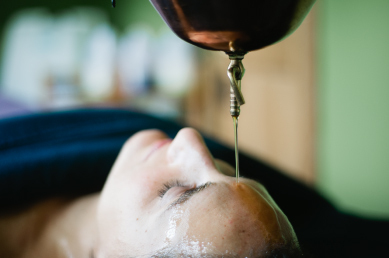 Clients will receive Shirodhara (often thought of as the Queen of all the Ayurvedic treatments), in which a stream of warm oil is continuously pored on the forehead to profoundly calm the mind and expand consciousness. Shirodhara activates the pituitary gland and can balance the hormonal system. In addition, this treatment has the added effect of awakening the third eye and stimulating cognitive memories. Clients may also receive other traditional Ayurvedic treatments to alleviate back pain and reproductive problems. Chakra Balancing using color and sound therapy may be used to fully integrate and charge the energetic system of the body which accelerates the healing process and allows for deep emotional healing and healing of associated physical blocks. There are 2 lovely rooms to stay at the Retreat Center on the 3rd and 2nd floor with a shared bath. Enjoy the beautiful gardens and walking trails just outside your door and the convenience of padding over to receive treatments in your robe and slippers. Inquire about availability on site or optional retreat accommodations on the Island overlooking the water or tucked away in the forest. Accommodations at the Retreat Center are $65/night. Each program is tailored for the client’s current state and constitution. The basic 3-7 day program consists of a daily check-in consultation and 3 hours of treatments . Clients are usually with us from 9am – 12:30pm each day. Herbal teas are included during your Panchakarma. Please schedule your Panchakarma 1-2 months in advance to secure your ideal dates. A 50% non-refundable deposit is required to secure your dates. Your balance is due on the first day of your Panchakarma.